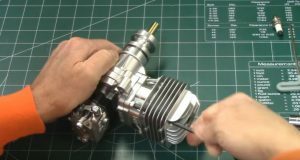 Maximize the power and run life on your DLE Engine with proper maintenance and quick fixes on worn out parts. We show you how! Some good basic points but could have been more through. Cleanliness, piston orientation, checking ring end gap, cleaning piston land of carbon, honing cylinder to help seat the ring, torquing cyl bolts. Does show some good points. Thank you. Some good points but a number of additional steps needed.